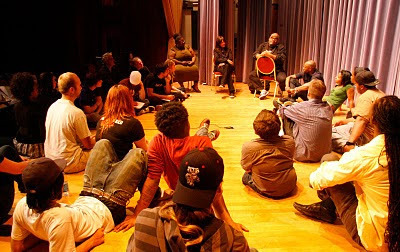 If there is one image that will stick with me from this year's Line Breaks, the rather epic multi-week music and theater festival I co-curated for the University of Wisconsin-Madison's Office of Multicultural Arts Initiatives (OMAI), it is the following: Students and community members sitting cross-legged on the stage of the Wisconsin Historical Society's theater, having a conversation with Stew, Heidi Rodewald, and Colman Domingo about art, career, Broadway, success and failure, social consciousness, passion, and so much more. The exchange was casual, honest, inspiring, occasionally surprising, and, to hear the students recount it, completely surreal. There is a lot about the festival of which I'm proud, not least of all the fact that we brought all of our original "wishlist" guest artists to campus for extremely successful performances. There were those who said we were being too ambitious for a market like Madison, and I'm glad my co-curator (OMAI/First Wave Creative Director Rafael Casal) and I didn't scale back. I don't believe in underestimating audiences (or our own ability to make it happen). In the end, it was clear we had the right combination of artists for both the chemistry of the series and for what our students could experience and learn from. I'm proud that we strengthened collaborative efforts with other campus partners who organize the exceptional hip hop events that follow Line Breaks. 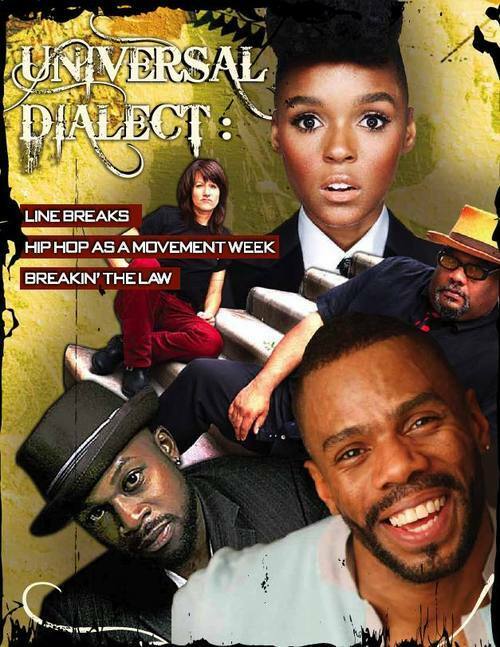 We created the Universal Dialect website and magazine (at right) for cross-promotional purposes and continue to come up with new ideas for future years' collaborations. It's all about joining forces to focus on common goals and make things happen. I'm proud that Stew said his show felt like a "master class." We strive to maintain an atmosphere of learning, workshop, process, and creation in this program and I'm glad it's translating to all who join us in Madison. I'm proud of the lives to come of every single piece and production that we saw on our stages over the two weeks. To say that everything we saw has a future far beyond our stage is a privilege. Stew and Heidi premiered some new work that sounds at once nothing like Passing Strange and yet still as (or even more) engaging, thoughtful and exciting - these new songs glowed. Colman's A Boy and His Soul has such a bright future I can hardly stand it. Even during the moments when I was crouched backstage waiting for the cue to turn on the disco ball, I could feel the incredible energy of that piece radiating through the curtain - both from the audience and the stage. Marc Bamuthi Joseph's The Break/s is just wrapping up its long and successful tour, but both the absorbing questions raised in the piece and the spark in its performer's eye foreshadow great new things to come. We're all just waiting for the moment Janelle Monáe bursts into superstardom. And our students are all poised for - and already exhibit - brilliance that belies their age and experience. It's a true honor to watch them blossom. Perhaps most of all, I'm proud that the artists in this festival proved that exceptional talents can also be exceptional human beings. Rafael made this point loud and clear on his own blog and it couldn't be more true of both our special guests and our young artists. Congratulations and thank you to all involved in this pivotal event. Upper photo by Deborah Berke.